Inside the John W. Olver Design Building–itself a teaching tool for builders and architects–the Building and Construction Technology program (BCT) has built eight movable, full-scale mockups of building assemblies to help students see how modern building components go together in the real world. At home in front of a class or wheeled into public view in the Olver atrium, the mockups display the complexity of roofs, walls, windows and floors, and the intricacies, sequences and attachment methods the multiple layers of these assemblies require. Current building technology, whether commercial or residential, has grown more complex under the demands of climate change and energy costs, and it is critical to understand how each component of a building’s “envelope” responds to the physics of heat, liquid water, water vapor and air. The mockups reveal each layer in cutaway with adjacent QR codes to supply more detailed information. The mockups were built by BCT lecturer L. Carl Fiocchi in collaboration with student Alexander Okscin, who graduated in May, and Peter Chrzanowski, operation manager in environmental conservation. Fiocchi said he got the idea for the mockups from similar displays he saw while studying at the University of Innsbruck, Austria. “It is not unusual, as I pass through the atrium, to see students and visitors hovering around an assembly, studying how the various materials are used and sequenced, and then scanning with their phone to learn more about an individual element. For me, it is a terrific reward,” Fiocchi said. The layer-by-layer mockups range from the minimum legal dictates to high-performance assemblies to cross-laminated timber (CLT) structres. Options are shown within groups, such as hot roofs vs. cold roofs, or various window integration protocols. The ninth mockup, under construction, will display features of the Olver Building itself, the most technologically advanced CLT building in the country, which features a glued-laminated timber column-and-beam frame, CLT shear walls, timber-concrete composite floor system, and unconventional cantilevered forms. Building supply companies donated many of the materials for the mockups. Cowls Building Supply in Amherst provided framing materials, plywood, insulation materials, clapboard, paint etc. ; A.W. 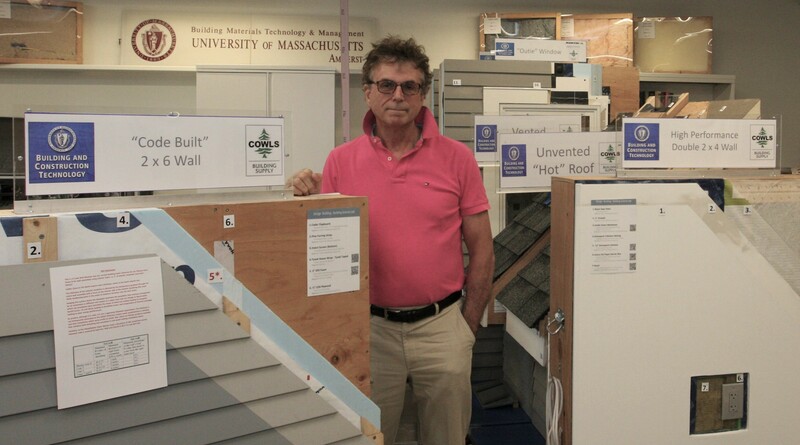 Hastings /Marvin Windows Co. in Enfield, Connecticut, supplied multiple window assemblies; and 475 Building Supply in Brooklyn, New York, supplied high-performance membranes and tapes.